Cape by Reville and Rossiter of Hanover Square, London. Many years ago I encountered this cape with an unusual criss-cross front. Detail of front of vintage cape. I was reminded of it by two different Butterick patterns. This one is Butterick cape 6975 from June 1914. Delineator. Note: I often have to crop images to show details because they would otherwise be too tall to see on a computer screen. Tall hats make it a real challenge. This page was 16 inches high. Butterick cape 2319, Delineator, April 1920. Two illustrations of Butterick cape 2319 from 1920. Images via Google and the Hathi Trust. I even found a story illustration showing a young woman wearing a simple criss-cross cape on board a ship. Story illustration from Delineator, 1920. Of course, that cape doesn’t really look very good, because the narrow criss-cross front straps conflict with the look of the dress under it. The high-end vintage cape, on the other hand, covers most of any blouse that would be worn under it. Cream and black cape by Reville and Rossiter of Hanover Square, London. This very high quality wool cape, which I found in a private collection, was made of tightly woven, creamy white wool, with a black silk lining and black accents. It reminded me of doeskin — but I think it was slightly brushed wool. Detail of vintage cape fabric, showing damage. Back of Reville and Rossiter cape. Part of the collar is black. The cape was probably intended to be worn and kept on, like a suit coat, because it was held in place by ties in back, near the waist. This cape would not be something you casually slipped in and out of during a visit; I think you would want to be standing in front of a mirror as you settled it on your shoulders and then reached behind you — under the cape — to tie the silk ties like apron strings. The pleated white bands end behind the wearer’s body in black silk ties, which have shattered. The silk ties, like the lining, were very damaged. The label in the cape says Reville & Rossiter, (1912) Ltd. Hanover Square W. — a posh London address. Back view of Queen Mary’s coronation dress, 1911. The embroidery represented flowers and leaves from England, Ireland, Scotland, and India. Image courtesy of The Royal Collection Trust. Reville & Rossiter made this Court dress with train, worn in September, 1913. Image courtesy of V&A museum. Detail of bodice on court gown by Reville & Rossiter, 1913. Notice the superb lace and the tassels at the waist. Courtesy of V&A museum. … and this 1919 evening dress, also at the V & A. The front of the Reville & Rossiter cape. The black buttons and buttonholes echo the back collar, also black. I suppose it’s possible that the cross-over front of this designer cape inspired copies, which became available as sewing patterns by 1914 — and the style was copied even more closely in 1920. According to The Royal Collection Trust, “Reville and Rossiter was a London couture house made court dressmaker to Queen Mary. It gained the royal warrant in 1910 and in 1911 designed the queen’s coronation robe. By the 1930s they were no longer in business.” You could say that our vintage cape, made in 1912, was fit for a queen. 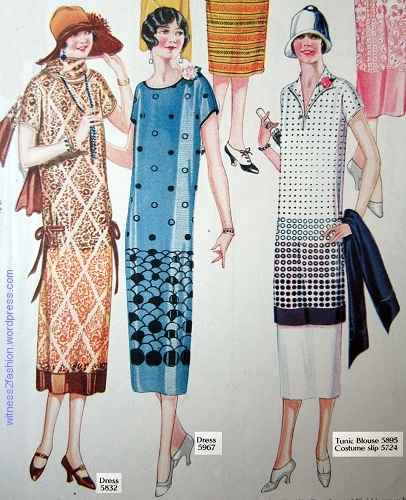 Almost the full page image of four outfits from Delineator, April 1914. Four outfits: eight patterns. This is a follow-up to a post that showed this image without any explanation. In 1914, Delineator was a large format magazine, much bigger than the average computer screen (or modern magazine) so I will have to chop up that image to show details of these outfits. The opposite page gave more information about each one, so I also have line drawings and alternate views to share. Important fact: Not one of these outfits is a dress. They are all separate tops and skirts. Butterick pattern numbers for the brown and blue-gray outfits at the top right of the page. It’s not always easy to figure out whether you’re looking at a dress, a skirt and “waist” [i.e., blouse,] or a “coat” and skirt in these fashions from 1914. Luckily, the old Delineator supplied plenty of alternate views. Sometimes an alternate view looks so different from the major illustration that only the pattern number shows that they are variations of the same garment. I’ll start by dissecting the gold-colored suit at top left. Butterick coat 6790 with skirt 6806. Delineator, April 1914. Coat 6790 and skirt 6806 look like a suit with a long jacket — that’s an illusion. First surprise: the jacket only reaches the waist. Coat 6790 with an alternate view, the lapel buttoned. Front and back views of coat/jacket 6790. The skirt includes a long tunic top. Skirt 6808 with two alternate views. The skirt, drawn in plaid with a bias cut top and two rows of buttons, looks very different. Butterick waist 6791 with skirt 6792. April 1914, Delineator. The height of these hats makes it hard to do justice to the entire outfit at once. Alternate views of waist 6791. This view, made in sheer or print fabric, has a high neckline instead of the V-neck shown in the color illustration. Skirt 6792 has two tiers over the skirt itself. Skirt 6792 could also be made in a sporty plaid, with more buttons, too. I wonder: were the tunics always cut on the bias, being based on a circle segment? Was the back always placed on the straight grain? These skirts must have been very warm, if every layer was lined. The drawing of the waistline on all these skirts shows how the corset of 1914 distorted a woman’s body; the boned front of the corset forced her abdominal area into a straight line, pushing the hips and pelvis back — which caused a sway-backed effect. The waistline of the skirt is therefore higher in the back than in the front — one reason why vintage blouses from the WW I era don’t stay tucked into your skirt in back if you aren’t wearing a 1914 corset! Ad for the Nu-Bone corset, Delineator, March 1914. You can see how the straight-front corset forces the hips and pelvis back. This Nu-Life corset is higher in back than in front — just like the skirts’ waistbands. Waist 6799 with skirt 6800. Incidentally, George Bernard Shaw’s play Pygmalion — which is the basis for My Fair Lady — opened in London in 1914. For the benefit of costumers, I’m sharing a lot of construction information. A closer view of waist 6799. It looks very short-waisted. Like the skirts, the waistline of the “waist” is higher in back than in front. This skirt is elaborately draped. Front and back views of skirt 6800. Skirt 6800 later appeared in a feature about bridal costumes. It is very formal. [Here, it looks like a cape, but it is a skirt.] The view on the left is the back view; on the right is the front view. Waist 6823 with skirt 6824. 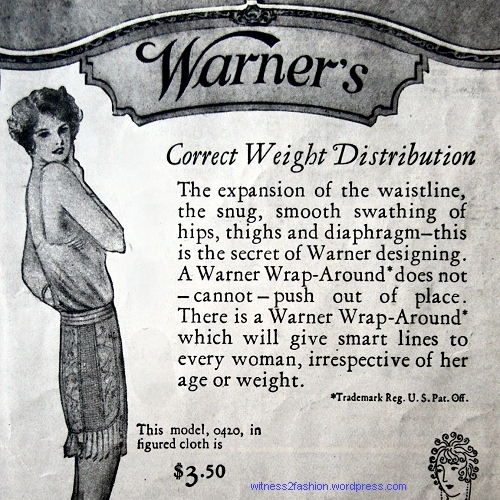 Wide hips were obviously very much in style in 1914 — in spite of those corsets. Three views of waist 6823. Again, the plaid version looks much less formal. It could be worn with a plain skirt. Skirt 6824 is elaborately draped in a “pannier effect.” The color image gives the back view. Description of the blue-gray waist 6823 and skirt 6824. Delineator, April 1914. A “short four-piece foundation skirt” eliminated the need for a waistband. The surplice-style waist/blouse was also made with a “French lining” to support and control the fullness. I’ll write about French linings some other day. Gold-colored Butterick coat 6790 with skirt 6806. Delineator, April 1914. Description for the gold-colored “suit” made by combining coat 6790 with skirt 6806. In addition to the color illustration, skirt 6806 was shown in a plaid version with a different coat on page 24. Butterick wine-colored waist 6791 with skirt 6792. April 1914, Delineator. Waist 6799 with skirt 6800 apparently in brown silk or taffeta. I don’t think “regulation” had any legal status — it was just the usual no-visible-waistband technique for making skirts.